Director Nobuhiro Yamashita brings together four Japanese High School girls for a tale of friendship founded by an event that will change each of them. The Shiba High Holly Festival is upon us and one of the acts to perform is already breaking up. Kei Tachibana and Rinko Marumoto got into a fight that ended with their guitarist Moe injured and Rinko too angry to continue. The band is on the verge of being left out of the festival when Kei decides that they will continue. Now Kei, along with Kyoko and Nozomi, are in search of a new direction to take the group before they have to perform in a few days. Viz Pictures continues to expand their live action line-up with the unique film Linda Linda Linda. Kei Tachibana (Yu Kashii; Death Note) leads the band of quiet outcasts with a tough exterior for those who don’t know her. After the trio discovers an old cassette tape with music by late 80′s J-punk rock band The Blue Hearts, they decide that they can play cover songs from the former group rather than write new songs. With hit songs like “Linda Linda” and “My Right Hand” selected, Kyoko Yamada (Aki Maeda; Battle Royale I & II) and Nozomi Shiroko (Shiori Sekine of the band Base Ball Bear) join Kei in the complicated selection of finding a singer: giving it to the first girl who walks around a corner of the school they’re watching. Rinko (Takayo Mimura; Battle Royale) happens to be the first “lucky” contestant, but turns down the offer. It’s only then that a Korean foreign exchange student happens to appear. Son (Doona Bae; Sympathy for Mr. Vengeance, Tube) agrees to join before she even understands what the trio is asking. Of course, teaching a Korean girl to sing a series of Japanese songs when she isn’t fully fluent in the language may just be a small detail to be explored. The new band of four start to work hard on dividing the jobs amongst the group. Kei takes up learning to play the guitar when her background is in piano. Son, who has enough trouble understanding her Japanese host country, tries to rent a karaoke room with some amusing results. 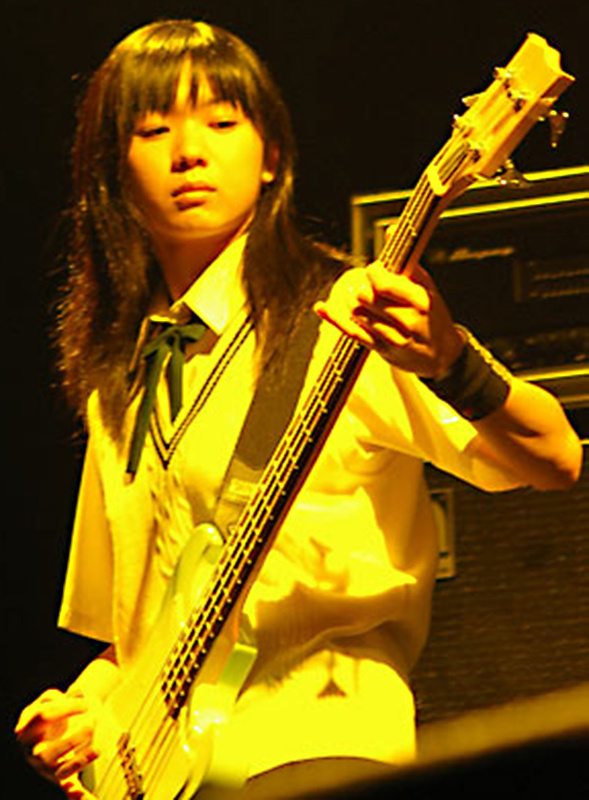 Nozomi’s bass and Kyoko’s drums become important parts to the group’s well-being so that they can unite in a matter of days. Each day explores the girls further advancement as a quartet and as friends while dealing with their own duties during the festival. Love even starts to pop up and complicate matters as Kyoko’s classmate Kazuya takes an interest, although nothing can be funnier than the suitor that only has eyes for Son. And what can a film about rock music be without a special appearance by The Ramones? Nothing, that’s what. Linda Linda Linda explores the daily lives of each girl as they come together for one important event in a simply beautiful story. The acting and cinematography fit the mood and shine as a prime example of a great Japanese filmmaking in what is usually a sea of amateur-looking B-movies. Doona Bae and Yu Kashii duel for the title of standout performance as their characters travel down alternate paths towards the same finish line. And the ending for this title will make you want to watch it again and again. Each character is given a real presence on screen no matter the size of the role. Minor characters often pop back up with a finish to their subplot neatly tied into the main storyline with ease. The score features music by the band formed by the girls, the Paran Maum, in addition to the original hits by The Blue Hearts and original music by former Smashing Pumpkins guitarist James Iha. Together, the story flows from day to day easily with the right touch of music to carry the mood. Linda Linda Linda is a rare gem and one that everyone should be required to watch at least once in their lifetime. The DVD-R screener gives only a straight look at the film itself so I cannot comment on the extras available for the U.S. release yet. The subtitle script is error free for the Japanese audio track and the video for the screener looked fairly solid against the Japanese retail version. Overall, I think fans of this film, which has been making its rounds through the indie film festivals for a while, will be pleased as will new fans getting to see this for the first time. Director Nobuhiro Yamashita and Viz Pictures have delivered a winner for the dramatic comedy hit Linda Linda Linda.